Vietnamese police have detained 20 people after hundreds of farmers protested on a disputed plot of land near Hanoi, state media report. Riot police used clubs and tear gas to evict the farmers who protested on Tuesday in Van Giang district of Hung Yen province near the capital. Villagers had camped in the area to try to keep the authorities and private developers away from the site. Land rights disputes in Vietnam are becoming increasingly violent. Around 2,000 police and security officers were deployed to repossess the area. "They threw stun grenades and came towards the field... then 100 bulldozers were sent in to clear crops," a local resident, who identified himself only as Kien, told the BBC Vietnamese service. A private company, Vihajico, has been trying for years to build a satellite city called EcoPark, covering 500 hectares of land in the area. More than 4,000 families will lose their farmland as a result of the development, AP news agency reports. 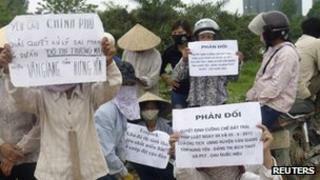 Residents have been offered 36 million Vietnamese dong ($1,700; £1,000) as compensation for every 360 sq m plot of land. However, some locals have said that the compensation is inadequate, and accuse officials of corruption. Land rights are a contentious issue in Vietnam, where the Communist government owns all land and usage rights are unclear. In January, fish farmer Doan Van Vuon made headlines after he used homemade mines and shotguns in an attempt to stop police from seizing his land.